Are you a zinester? Do you like a challenge? Well, we’ve found a zine challenge just for you: create a zine from start to finish in 24 consecutive hours! That means 24 hours from the time you think of the concept until it’s bound and ready to be mailed. Interested? 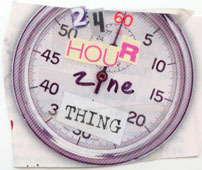 Check out 24 Hour Zine Thing ! What are you waiting for? The deadline is July 31, 2013. Look at what the Booklyn Artists Alliance is doing in celebration. Pretty Cool!